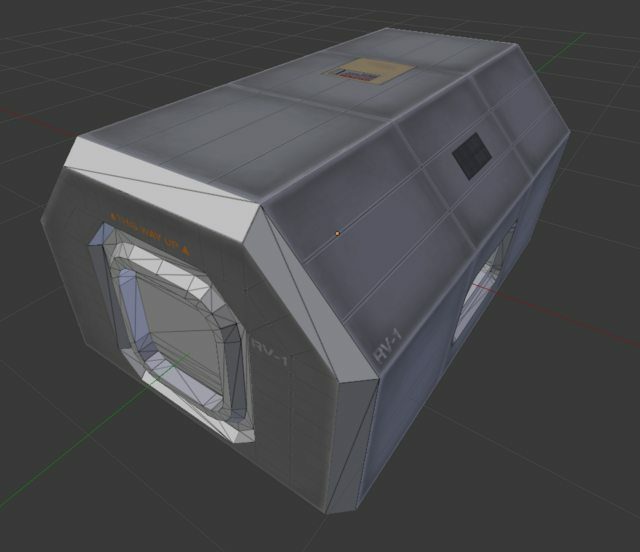 The RV-1 Rover Cabin is feature complete and is now available for download! 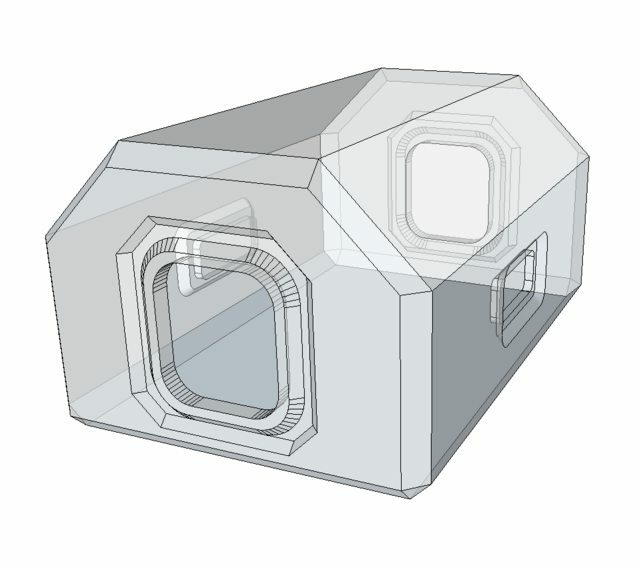 edit - updated to version 1.2 to fix offset attachment nodes. This work is licensed under the Creative Commons Attribution-NonCommercial 4.0 International License. To view a copy of this license, visit http://creativecommons.org/licenses/by-nc/4.0/. You must give appropriate credit, provide a link to the license, andindicate if changes were made. You may do so in any reasonable manner, but not in any way that suggests the licensor endorses you or your use. Thought I'd jump into the 'ol KSP add-on bandwagon. I've been playing for about a year, and I've found myself spending quite a lot of time buildling and testing rovers. Unfortunately, the game seems to have a dearth of rover parts, which is surprising considering the Mk2, SP+ and MK3 packs that Porkjet has made for Squad. Anyway, I've been feeling kind of inspired, so I've started to learn some basic parts modding to hopefully build a kit of parts for stockalike, long-distance ~2m modular rovers. Here's the first part I've made - a crew cabin. It houses 4 Kerbals, and is based off the PPD-10 Hitchhiker Storage Container. 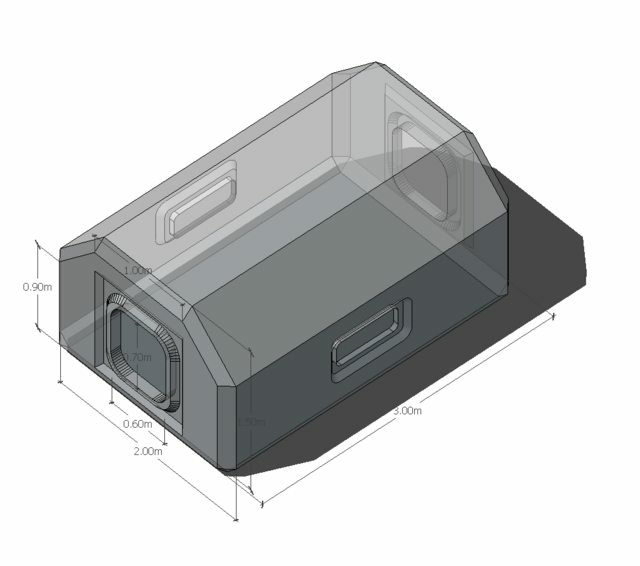 Note: its the big grey chamfered box. Also, I have a Lackluster Labs truck cab on the front from waaay back. Any feedback from the community? Constructive criticism is welcome. Looks pretty nice so far. Could we get more screenshots of different views? Nice wagon! Keep up with this beuty! Thanks for the compliment! I mean, it isn't exactly much to look at right now, particularly since I reused textures for most of the sides. I used the stock KSP textures from the lander can and MK3 shuttle as references. I'm thinking that I may want to switch to a corrugated metal texture and add windows for visual interest and a future IVA view, for instance. Design work was initially modeled in Sketchup (I'm pretty skilled with it), imported into blender for texture work, and finally Unity to output it to KSP. Nice work! I like the look of this. I'm not sure if corrugated metal would be appropriate for this rover body, but windows and IVAs sound like a great idea! As i've said on the Reddit it's simply beautiful, + rep! I think it looks good, myself! 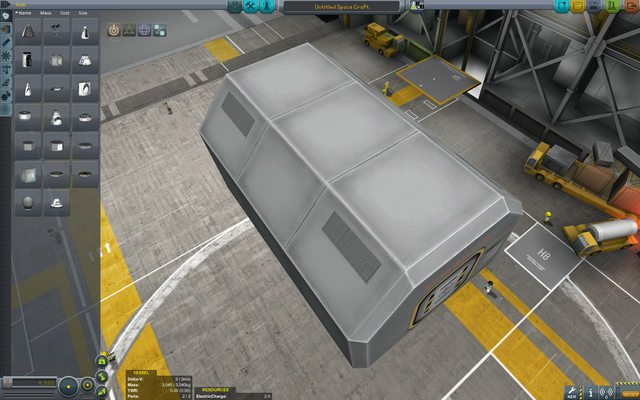 I wonder - it might be neat to just reuse the same model with more or less the same textures (maybe some part of it could have a texture-swapping colored patch, or something) and make a container that would fit on top of the Mobile Frame System stuff: http://forum.kerbalspaceprogram.com/threads/107791-0-90-Mobile-Frame-System-MFS-%28v0-1-0%29. They look like they might go together well - the cabin you've made looks like it would be perfect on them. Then again, I guess the FTT containers (apparently) fit pretty well on there too, so maybe it's not worth the effort. 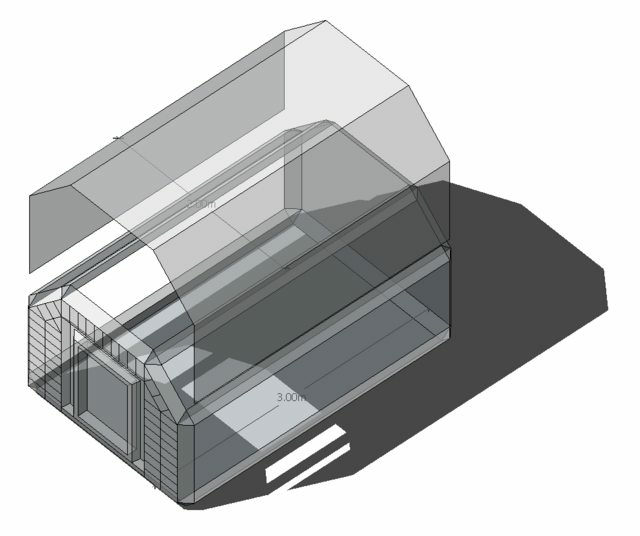 And/or maybe a very large KIS container (comparatively)? This is very nice! Are you also planning to make an LRV type rover or are you sticking to closed rovers? Wow, thanks for the recommendation - that is a really interesting project that I've never heard of before. My intent was to create a set of flexible parts that you can attach to anything, but provide some better-looking, stockalike parts that actually look like they might go on a rover, rather than sticking a round hab unit on wheels. Looks like I'm going to have to download FTT and the Mobile Frame mods and check out their dimensions. 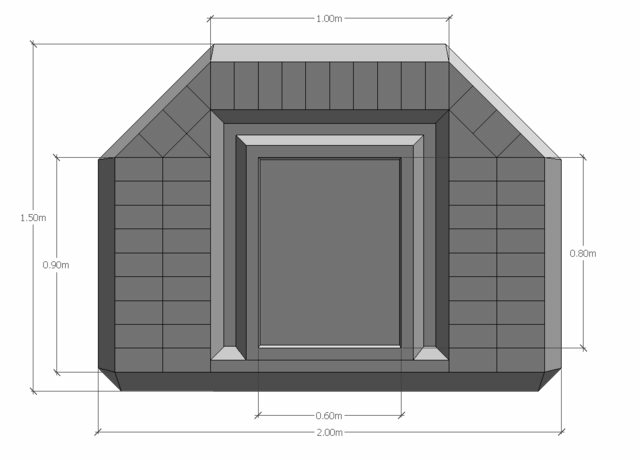 The size of this cabin will be resized to 2m width x 3m length x 1.5m height, with .1m wide structural envelope. (I'm an architectural designer) I believe I can cram 4 kerbals inside the cabin with bunk beds, a mess, a bathroom+shower unit. ...which I hadn't even heard of until after I posted this thread today. 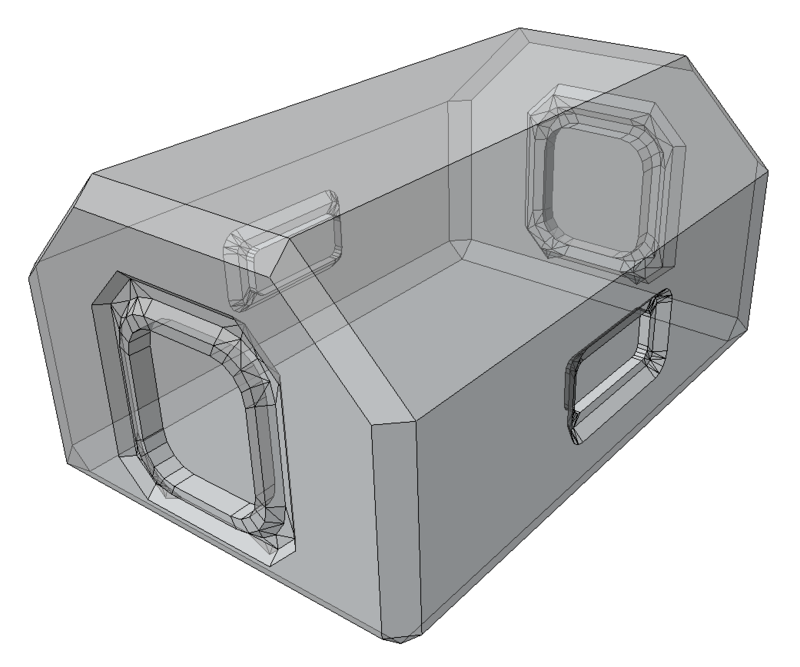 In any case, I want my parts to be more flexible and be able to mix and match with other stock and stock-like parts. For instance, Bobcat's DEMV was a self-contained rover, but it also kind of took away all the fun out of building your own craft. Ah! Probably going to stick with enclosed rovers - I figured the command chair is sufficient for now, and there are some existing mods like this one that fill the niche: http://forum.kerbalspaceprogram.com/threads/86343-New-project-from-ASET (hard to compete with!). Hey, looks good! I'd definitely use this. Perfect for your base rovers or something. And yeah, KIS containers on that baby would be amazing! I like it, the hatch could use some bumpmaps though. This is pretty sweet. Texture reuse works really well here, gives it a wonderful stockalike feel. Maybe consider making some fuel tanks/structural pieces/massive batteries/science packages using the same model? Maybe use FSwitch to cut down on part count? Thanks for the compliment/suggestions. I'm still pretty new to this... what is FSwitch? I would like to say that I've been really inspired by the absolutely beautiful models and textures created by Porkjet - the Mk2, SP+ and MK3 models, as well as Bobcat's DEMV series of rovers from a few years back. Also NASA's Space Exploration Vehicle. 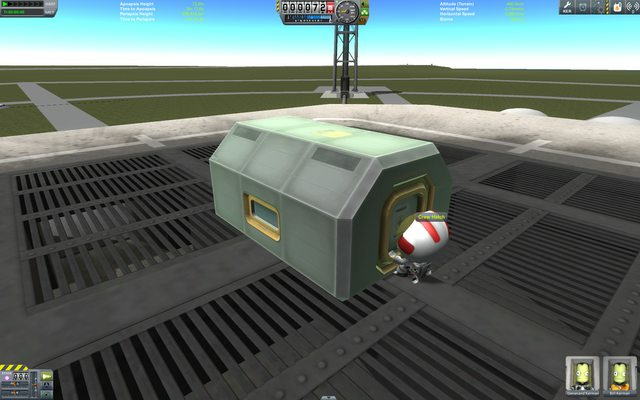 I've spent a lot of time building rovers in KSP and I've been itching for a 'kit of parts' for rovers like we have for the rest of the game, and figured why not? It can't be that hard! 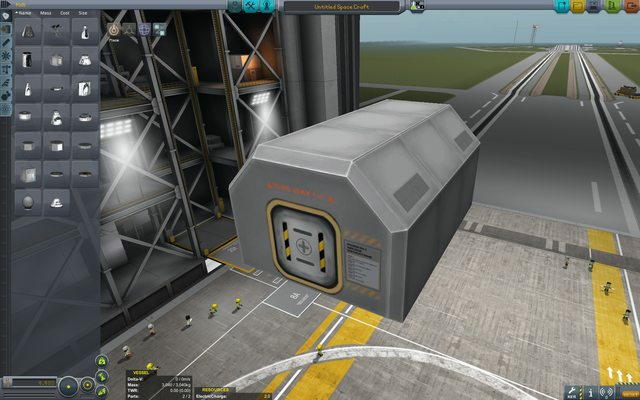 My goal is to ultimately make a few parts that can give your Kerbals long-distance, long duration on-the-ground roving mission capability, while keeping your Kerbals in relative comfort... and safety. Parts that can work together while also being generic (stockalike) enough to work with stock and other mod parts... and also being rugged enough to withstand crashing. In particular, this means I'm not doing any wheels. However, I'd also going to give a shoutout to the really slick Exploration Rover System by alexustas. I just ran across it after I posted to the forums, it's pretty cool but a little different than what I'm trying to accomplish. Looking at your mission statement, you might be able to do several things with one part. Let's say (just for the sake of argument) that you made a piece that looks basically identical (same textures, shape, width etc.) to the one you've made already, but 1/3 the length (and lacking doors). Using FireSpitter's FSFuelSwitch module (or Modular Fuel Tanks, too), you can swap out the fuel/electric charge/whatever contents of your single part so that you only need to make one model for both the monoprop tank, the multi-flex fuel tank, the life support tank, the battery power unit. I think FSFuelSwitch (or maybe FSTextureSwitch only) also makes it possible for you to change the part's texture too - so you could build in a square panel somewhere on your model (for example) and use different textures on that panel that correspond to different tank contents. Sorry if you already know about this, I'm just making assumptions based on your question about FS switching. You could even use FireSpitter's mesh switching (see the Mobile Frame System mod) to have one part, like your open frame, that has many different possible configurations. Not necessary, but helps with part clutter. Depends on what you want to do - but the FS texture switching at least seems not terribly complicated, and fuel switching is done via config only (I think). Mesh switching I have no clue. Ok, here are a couple of new sketches for redoing the ends and to act as a guide when retexturing. This actually looks pretty dope! I will be watching this mod. You prob should look into working with the creator of Mobile Frame System, since from the look of it, it seems like your part will fit nicely on those frames too. 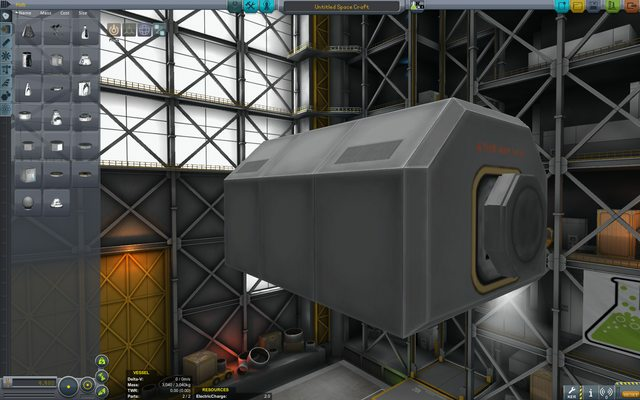 And they may even be stack together to make a trailer for kerbals to live in. Update - finished adding details to model - resized hatch & side window. Another update - I'm in the middle of creating the textures for the rover cabin. All of the geometry is finished. I have an idea for a part. ie: the sph says:it is pointing up, not forward! the vab says:it is pointing sideways! the part says on the runway : I am going forward. This looks good, it will be good to have more options for rovers. Your ideas for future parts sound good and I will be looking forward to seeing more, I am particularly looking forward to seeing the airlock. 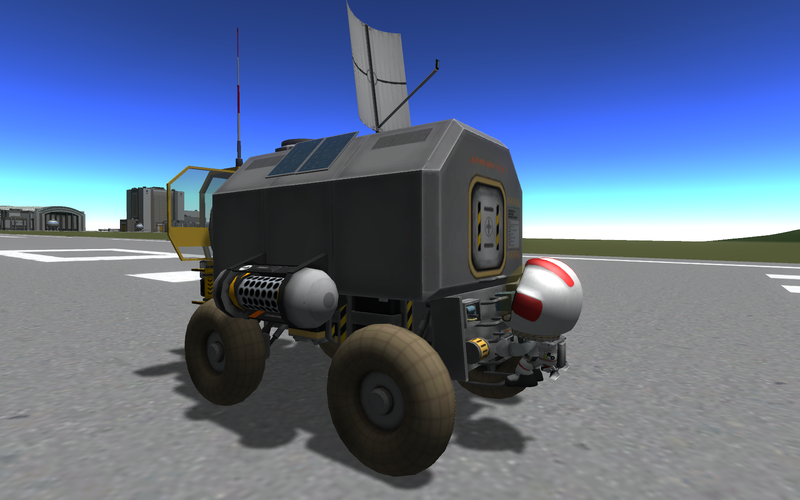 Just to let you know there is another rover mod in a similar shape to yours which may be useful to you: http://forum.kerbalspaceprogram.com/threads/86695-0-90-USI-Exploration-Pack-Small-parts-big-adventure%21-v-0-3-1-2014-12-24 but its nice to have some enclosed rover parts like yours. Not only do they look like they can be used for rovers but they look like they could be used for bases on other planets and moons. Thanks for developing this.